Board Game Saturday on Wells 4 Febuary 2012 | Action Points! This week’s board game Saturday saw a drop in attendance, but was still enjoyable. The main event on Saturday was actually the first Dungeons and Dragons session of 2012, although it did not involve the main campaign directly. In fact, it only involved 3 of the regular members of the D&D group, and 2 players who were completely new to the game. I’m feeling kinda rusty now after not playing for nearly 2 months, but it was quite nice to be back in the driver’s seat again and DM a game. Since we spent a lot of time playing D&D this past weekend, I thought I’d touch on it a bit. The system we are playing is 4th Edition, which to our group is really treated more like a tactical combat game than a role playing experience. I think part of it is my inexperience as a DM and providing a conducive environment to encourage role play, but it’s also a fact that combat is what the players are primarily interested in. I don’t think it’s any fault of the system, it’s just what the players seem to enjoy and we probably would have latched on to 4E from some other system anyways to fit our group’s preference. One thing that attracted me to 4E in the first place was its similarity to Tactical RPGs like Final Fantasy Tactics and Disgaea, with the battle grid and miniatures, and in terms of story and them: I finished Disgaea twice, but never finished Final Fantasy Tactics. That probably tells you something about my preferences for storytelling (Extra servings of cheesy humour and exploding peg-legged penguins for me please! Not that I’m averse to good storytelling, I probably just have ADD. Random aside: Despite the highly amusing rant, the prologue to Kingdom Hearts 2 was one of my favourite parts of that game. I was genuinely sad when I had to leave Twilight Town.) I do try to inject some opportunities for role playing into every session, but if your players want to beat up on some mooks, I say you let them beat up on some mooks. In the end, the D&D experience should be fun for everyone, whether it’s convincing the mayor to fund your new business venture with the kobold boomwrigglers or beating up kruthik with bladed implements. Anyways, I ran a quick one shot with 5 PCs on Saturday which I came up with pretty much 30 minutes before the start of the game. Surprisingly, we actually managed to cram in 3 encounters in this session, even though we had to spend more time setting up and explaining the game to the new players. The PCs were simply tasked with recovering a magical artifact that was stolen from the magical university. Simple enough, but I had a little fun with the party by sending them to question a drunken librarian with an eidetic memory about the stolen artifact. Probably my favourite moment in the session was when the party asked the librarian about what books a certain light-fingered student had borrowed from the library and the dwarf proceeded to list out every single book that student had borrowed since she first joined the university. Although in hindsight I should have come up with a list of funny book names beforehand to throw in randomly. Coming up with amusing (to me!) NPCs is one of my favourite parts of being a DM. Another memorable moment in the session was Nix Sun’s Sorceror rolling a critical miss on an attack while on 4 HP. He used the “Good Timing” power to reroll the attack, got another critical miss, took damage from the power and went unconscious. Aaaaaaaaaamazing. 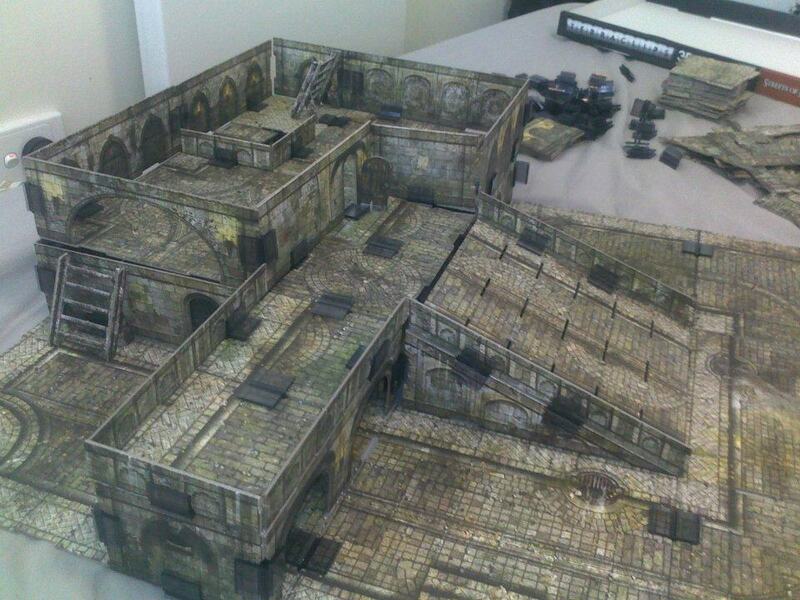 Also, Jin Wei was kind enough to supply us with some amazing 3D terrain tiles (Terraclips) that lead to an amusing second encounter. It was also our first time using the magnetic status markers from Alea Tools, which worked pretty well. 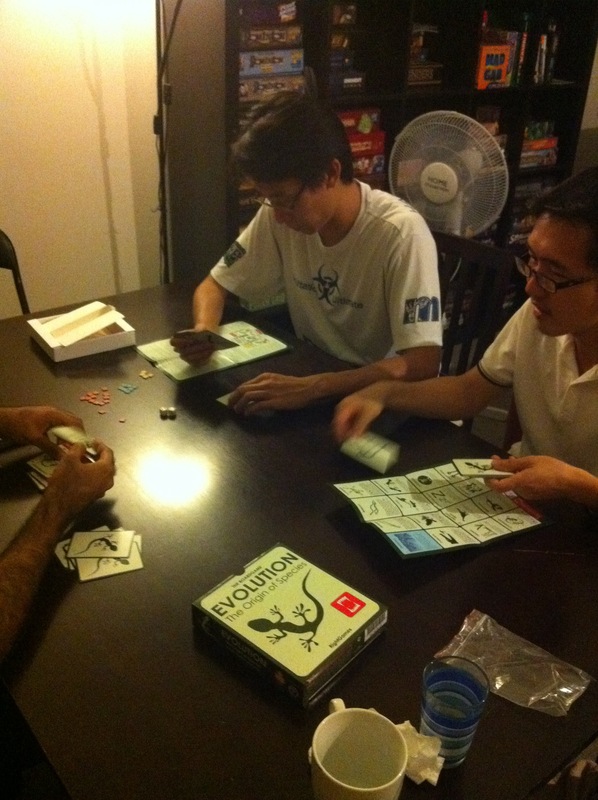 After Dungeons & Dragons, we decided to play a relatively light game and tried one that I had actually never played before – Evolution: The Origin of Species. It’s not on my Achievements List, as I did not buy it; it was a review copy that Steven generously left at our place to play with at our leisure. Evolution is a pretty simple card game where players take turns to play cards – either face down as a new animal, or face up to represent one of the Traits that your animal has evolved, until all players have passed. If you pass, you may not play any more cards this round. After the cards are played, a pair of six sided dice are rolled to determine the amount of food available this round. Players then take turns taking 1 of the available food available or activating their animal’s Traits until everyone has passed yet again. Animals can only eat enough food to make the Fed, which is usually 1 Food per animal unless modified by certain Traits. Once all players have passed, each animal that is not Fed is discarded and all food tokens are returned to the supply. 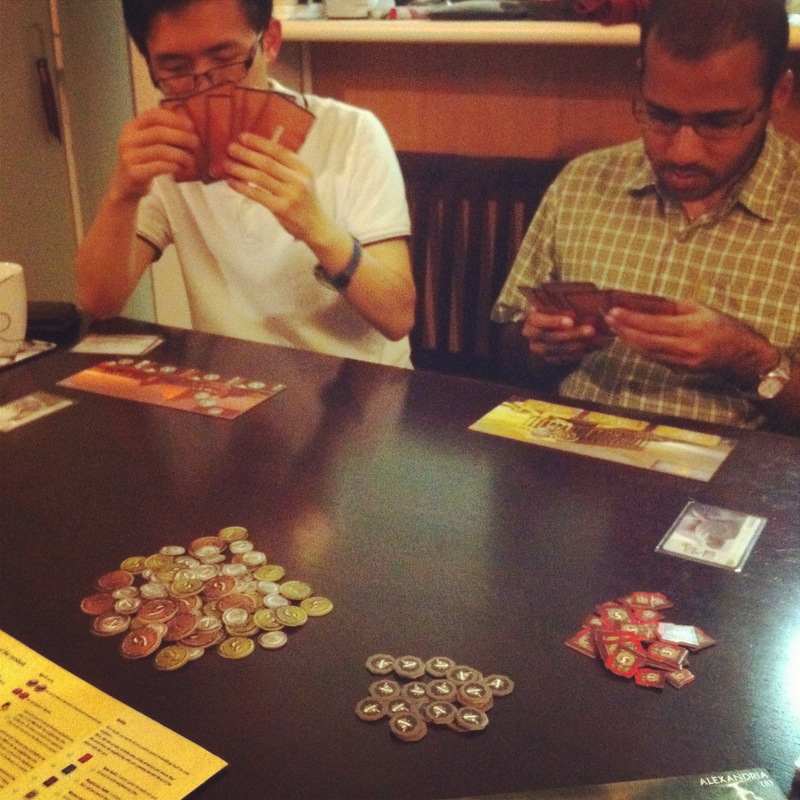 Each player then draws new cards depending on the number of surviving animals he or she has and a new round begins. The game keeps going until the deck runs out of cards and you only score points at the end of the game for your surviving animals and what Traits they have. The gameplay in Evolution is fairly simplistic, and it is the diversity of the Traits that makes it interesting. One of the most significant Traits is Carnivorous, which allows you to “eat”/discard the animals belonging to other players to feed your animal. The food gained from eating another animal is from a separate pool than the food tokens made available each turn, which thus encourages carnivorism when the food supply is low. This encourages plenty of conflict between players as a kind of genetic arms race happens and players keep adding Traits to their animals to make them harder to eat. That aspect of the game, in the middle stages, was quite fun as we each tried to improve our animal’s defenses while those players with Carnivorous animals tried to improve their Carnivores to be able to eat other animals available. However, the luck inherent in rolling the dice to determine available food did play havoc with our plans. Part of the problem was that it was our first game, and we did all realise how best to combine the Traits on our animals. Overall, I think it’s a decent light filler game that I would not be unhappy to play, but I wouldn’t clamor for it either. A solid 2.5 out of 5 detachable tails for Evolution: The Origin of Species. My Wonder was the Lighthouse of Alexandria, while Heng Lin had the Pyramids of Giza, Prateek had The Temple of Artemis at Ephesus and Jin Wei either had the Colossus of Rhodes or The Hanging Gardens of Babylon. We were all playing with the B sides. I started the Leader draft with a strong first pick of Justinian (3 bonus points for each set of Civic, Science and Military cards). I took Alexander on the second pick, but wasn’t ever keen on using him. I managed to get Bilkis on the third pick surprisingly, as I feel she is very useful for any strategy. I don’t remember who I got as my last Leader, but it obviously wasn’t as important as Bilkis and Justinian. Bilkis along with the first two stages of my Wonder completed before the start of Age II provided me quick access to all the resources early in the game, which then allowed me to reduce the number of resource cards I needed to play and allowed me to play whatever Age cards I wanted to complete my sets for Justinian’s bonus. The combination of Wonder and Leaders, as well a fairly even distribution of Blue, Red and Green cards among the draft sets allowed me to collect 4 sets for 12 bonus points at the end of the game. I also managed to get a set of three Science cards as well as the Palace, and multiple Military Victory Points due to constantly having a high amount of Red shields, which allowed me to win the game handily. 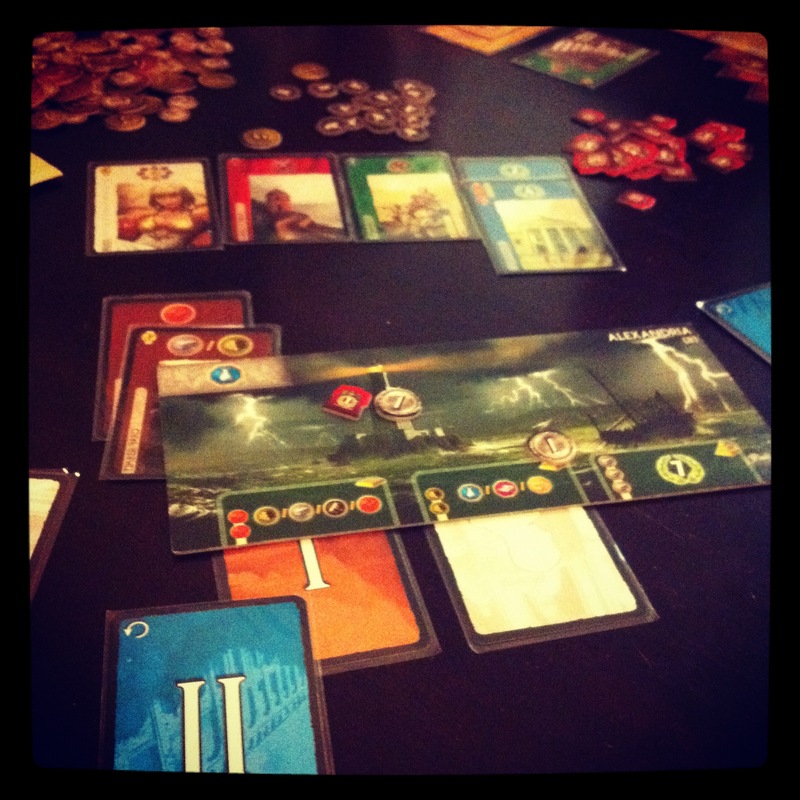 As always, 7 Wonders is a joy to play. It helps that I won, heh. 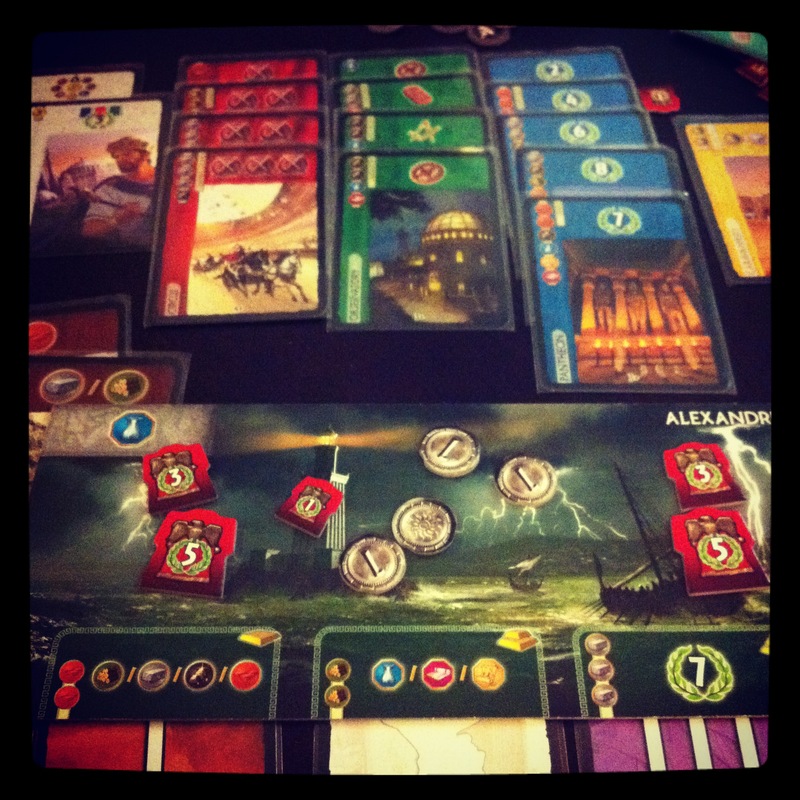 I was also pleasantly reminded how quick a game of 7 Wonders can go by, even with the addition of the Leaders, and I was itching to play a second game after completing the first. 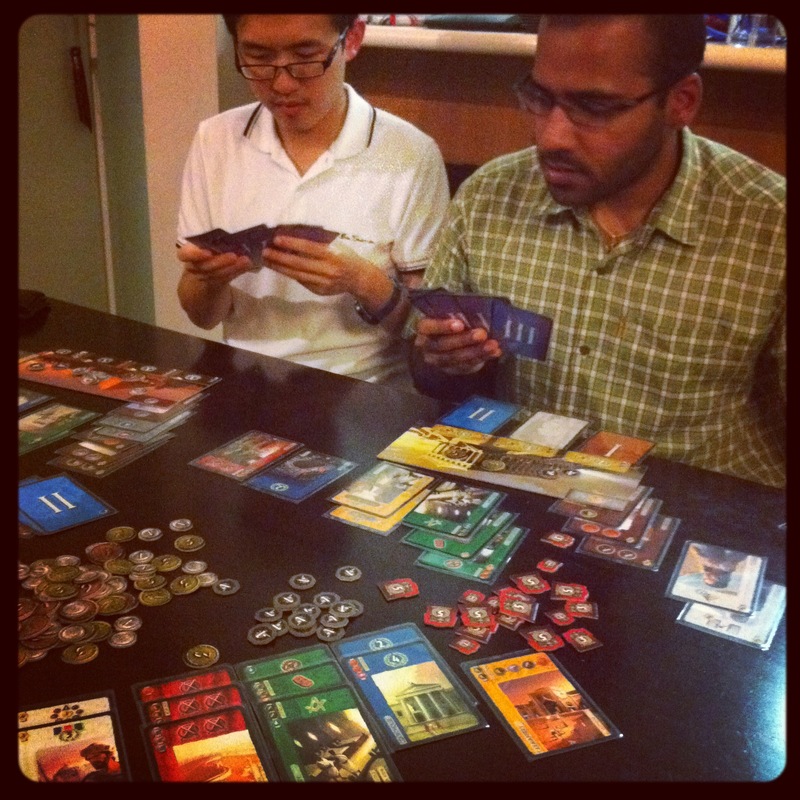 However, I had some other commitments to attend to and we had to end game night with only two card games played. Hopefully this weekend I can finally put Risk Legacy on the table!